1. Go to one of the two stops on the campus-to-campus route. Shuttles arrive about every 20 minutes at Coliseum Campus and Harshman Hall on the North Campus (see the route map). 2. Get on the shuttle. Shuttles are wheelchair accessible. Never cross in front of a shuttle. 3. Find a seat. Always follow instructions from the driver. If no seat is available, you may need to wait for the next shuttle. • In the roundabout on Ivy Tech’s Coliseum Campus, in front of door 3. • At the south entrance of Harshman Hall on Ivy Tech Fort Wayne’s North Campus. Since Citilink’s fixed service (Routes 3 and 4) serves the Ivy Tech campus areas, it has agreed to continue providing 31-day passes to Fort Wayne colleges and universities at a 10 percent discount. For 2018-19, a 31-day unlimited trip pass is $40.50 with the discount (regular price $45). A valid student/employee College ID is required for the pass discount. A maximum of four (4) passes per person per semester can be purchased, and each pass will be active 31 days after its first day of use. Individuals should visit the Ivy Tech Bursar’s Office in the Express Enrollment Center at the Student Life Center on the North Campus (3701 Dean Drive, Fort Wayne). Ivy Tech healthcare specialist students traveling from Coliseum or North campuses to the Parkview Education Center can connect from the shuttle to Citilink’s Route 4 at Ivy Tech’s North Campus stop at Harshman Hall. Riders will take Route 4 north and disembark at the Ludwig and Lima roads area, which is nearby by the Parkview Education Center (1919 W. Cook Road, Fort Wayne). A Citilink bus pass would be required. Profanity or loud, abusive or disruptive behavior; consumption of alcoholic beverages; playing of any audio device without earphones; weapons of any kind or hazardous materials (gas cans, car batteries, etc. ); littering, destroying or vandalizing any property; and any other activity prohibited by law. Failure to respect any of these restrictions may result in removal from the shuttle. Ivy Tech’s Career Development office provides professional dress for students getting ready for job interviews. Career Development is located in Harshman Hall, Room HM1102, or call 260-481-2282. Ivy Community Cupboard Food Pantry is an affiliate of the Community Harvest Food Bank. Walk-in Hours: Tuesdays, 11 a.m. to 1 p.m.; Thursdays, 3 to 5 p.m.
Ivy League Coaching provides an additional layer of support to students to help them become academically successful. Coaches meet with students once a month, provide academic empowerment, and refer them to additional resources across campus. In 2013, the Indiana General Assembly passed legislation allowing a one-time opportunity for some qualified felony convictions, misdemeanors, and arrest records to be expunged from criminal records. This program provides legal assistance to low- and moderate-income community members and veterans with criminal offenses seeking expungements. To learn more about the program, contact the Volunteer Center at 260-424-3505. For questions regarding specialized driving, please call the Volunteer Law Program at 260-407-0917. Second Chance Sponsors: 2-1-1, Indiana Legal Services, Inc., Ivy Tech Community College Fort Wayne, Neighborhood Christian Legal Clinic, Volunteer Center, and the Volunteer Legal Program. Ivy Tech Fort Wayne has several different emergency funds to assist students with their financial challenges. For assistance, contact Ashley Skinner, Harshman Hall, Room HM2102. Call 260-480-4209 or email askinner16@ivytech.edu. Drop-in tutoring on Saturdays 9a-1p. Ivy Tech Fort Wayne's Early Childhood Learning Center offers faculty, staff, and students a convenient, affordable (part-day) preschool option Mondays through Thursdays from of 9 a.m. to noon. The ECLC is located in the Student Life Center on North Campus, 3701 Dean Dr. 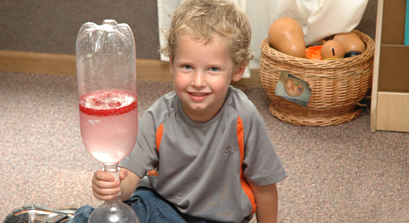 The preschool is staffed by Early Childhood Education faculty and students who develop learning experiences designed for your child, based on his or her interests and needs. Our spacious classroom accommodates a maximum daily attendance of 15 children. You may enroll your child two, three, or four days a week. Tuition is $175/four-week session for the four-day enrollment, and $105/four-week session for the two-day enrollment, 9 a.m. to noon. Optional extended hours are available beginning at 8 a.m. and ending at 1 p.m. The contracted extended care rate is $4.38 per hour. While you study or work, your 3-, 4-, or 5-year-old child may explore, learn, and enjoy his or her time at the Early Childhood Learning Center. The Learning Community is located at 2041 Reed Road, close to the intersection of State and Reed roads. Questions regarding The Learning Community's services and rates should be directed to Brad Hand, administrator of The Learning Community, at 260-424-8852. For more information, visit TLC's Web site. The Early Childhood Alliance (ECA) assists individuals in identifying child care centers within a geographical region and also provides resources like the Paths of Quality rating system and questions to ask when interviewing child care providers. The State of Indiana maintains an online directory of early childhood home- and center-based care programs, where you can search by zip code or address. For the convenience of students, employees and guests, Ivy Tech Community College Fort Wayne has a few eateries on campus with a wide variety of breakfast, coffee, lunch, dinner, and snack items. Both are open during the fall, spring and summer semesters (hours are below). Please visit and try some of the delicious selections. Plus, there are ALWAYS specials going on with great deals! Mon-Thurs 8:30 a.m. to 6 p.m.
Fri 8:30 a.m. to 1 p.m. Launched in 2010, Ivy’s Catering at Ivy Tech Fort Wayne has successfully served hundreds of catering events representing thousands of satisfied customers both locally and from around the globe. Developed from the many requests for catering from the campus kitchen menus of the Blue Bamboo Café and Wrap 'N Roll Deli, we have transformed into a full-service caterer offering a wide range of service styles and menu complexities. We aim to please with our fresh and just-in-time approach to catering delivery. You can earn a certificate in 12 weeks. Ivy Works at Ivy Tech Community College Fort Wayne helps remove the non-academic barriers for students receiving Supplemental Nutrition Assistance Program (SNAP) benefits by providing wraparound services. Ivy Works, which will run through September 2019, is for Allen County residents and aims to help 100 students. The nutrition assistance program is run by the U.S. Department of Agriculture’s Food and Nutrition Services and targets low and no income families. Benefits are administered at a state level. Learn more at IN.gov. Other statewide discounts can be found here. Ivy Tech Community College is partnering with Catholic Charities to offer a new program on campus this fall. Stay the Course™ provides comprehensive support services to low income students with the goal of helping them persist in school and obtain their degrees. These services are targeted at helping eligible students overcome obstacles outside of the classroom which might otherwise result in the student having to drop out of college. As part of Stay the Course™, a team of professionals will work with students to create a personalized path to graduation. Stay the Course™ staff is particularly focused on helping students deal with the life obstacles, such as loss of housing, drop in income, or family emergencies, that create roadblocks along the path to graduation. Navigators help students become familiar with the college system and manage situations outside of school which affect their ability to stay enrolled. Stay the Course™ also has limited financial assistance available to help students overcome short-term financial hardships that threaten their ability to stay enrolled in school. Students who are enrolled in Stay the Course™ are able to apply for up to $500 per semester, with a $1500 cap over the next three years of enrollment at Ivy Tech Community College. Due to limited funding, only a small number of Ivy Tech Community College students are eligible for Stay the Course™ at this time. Through a lottery, students are randomly selected to participate. Students are notified via email and USPS mail that they are selected. Because this is a research project, service offerings vary by participant. DO STUDENTS PAY TO BE IN THIS PROGRAM? This program is provided free of charge to students that are randomly selected to participate. This program is funded by a generous donor who is interested in helping students complete their education. Stay the Course™ services are provided by Catholic Charities. If you have questions about the program, please feel free to call Tiffany Ham, (260) 422-5625, ext. 237. Catholic Charities staff is also available on the Ivy Tech Community College in Harshman Hall, Room 2242. DOWNLOAD A ONE-PAGER ON THE PROGRAM. The Bowen Center, a Warsaw-based non-profit mental health care services provider, partners with Ivy Tech Fort Wayne to provide students with two free on-campus information sessions. Counselors will then refer students to a specialist at one of the Center’s treatment facilities. Need to talk to someone outside those hours? Identify yourself as an Ivy Tech student to speak to someone for free. TRIO Student Support Services offers services to 160 first-generation, low-income, and/or students with disabilities as they pursue a college degree from Ivy Tech. Specifically, our goal is to provide individualized support to eligible students seeking to complete a degree or certificate from Ivy Tech within a three-year timeframe. Admission to our program is not automatic; it is a privilege as we are limited in the number of students we can serve. Furthermore, you will be required to use certain services based upon our assessment of your needs. TRIO activities are free and exclusive to participants. If you are a student who has been away from school for some time, a brand new student who feels unprepared for college, or a student who is wondering if you can succeed, TRIO Student Support Services might be the right place for you. Federally funded by the U.S. Dept. of Education ($243,987 annually) with support from Ivy Tech Community College Northeast. Be enrolled or accepted for enrollment at Ivy Tech Community College Northeast in addition to needing academic support to complete a college degree or certificate from Ivy Tech within a three-year timeframe. Be willing to maintain a 2.0 GPA. What does TRIO Student Support Services provide to participants? Motivation, encouragement, and accountability: According to current TRIO students, these are TRIO’s most valuable services, aspects that are woven through every other part of the TRIO program. Personalized education planning with continuous academic monitoring: An individualized education plan is the culmination of a process of assessment and goal-setting. This plan is reviewed and amended regularly with written and verbal feedback. Regular advising and mentoring: Continuous advising for academic and life purposes with regards to degree programs, financial aid, other college offices, community services, referrals, etc. Tutoring: TRIO Support Specialists provide between 50 and 90 hours of weekly, walk-in tutoring every semester in the TRIO Resource Center, an exclusive TRIO computer lab. Personal problem solving: The TRIO staff listens and offers feedback on a variety of student issues and needs. Financial and economic literacy: Money matters whether we like it or not. The TRIO staff provides financial aid advising, helps with scholarship searches and applications, and teaches about the various aspects of financial literacy that may distinguish success from failure. Extracurricular and cultural events: Participation is encouraged in Student Life organizations like Phi Theta Kappa, the Campus Activities Board, and the Student Government Association. TRIO students often become campus leaders and organization officers. Free tickets are sometimes provided to local community productions, and the TRIO staff coordinates several volunteer, community-service initiatives each year. IvyLearn/online communication: An online Blackboard community provides 24/7 access with up-to-date information and resources. The TRIO staff also sends regular email announcements to program participants and provides tutoring for many of the college’s online communication systems. Workshop seminars: Close to 30 workshop seminars are conducted every semester, including budgeting, note-taking, overcoming test anxiety, navigating financial aid, problem solving, time management, quick cooking tips, healthy personal relationships, and more. Life and study skills: Since life cannot be separated from the college experience, many TRIO services provide emphasis on both life and study skills. Many TRIO students juggle the commitments of family and work while attending school, and the TRIO staff work to respect these obligations while encouraging and supporting educational progress. Computer loans: TRIO students have the option of checking out a laptop. Monthly newsletter: The TRIO Tribune is published each month and includes college information, program announcements, study tips, guidance, and important news and deadlines. Early warning system: Instructors are asked to notify the TRIO program of grades below passing and absences that could cause a problem. The program’s goal is to intervene early before a small problem becomes a large and unmanageable crisis. What is TRIO Student Support Services' success rate? Nationally, students in TRIO SSS are more than twice as likely to remain in college than those students from similar backgrounds who did not participate in the program. How do I apply for TRIO Student Support Services? TRIO is constantly accepting applicants, both new students and those closer to graduation. A student who wants to succeed may apply at any time by completing an application. Contact the program office by calling, e-mailing, or stopping by. As a TRIO participant, what will be expected of me? Admission to TRIO is a privilege, as we are limited in the number of students we can serve. Furthermore, students are required to use certain services based upon our assessment of their needs. Most TRIO activities are free and exclusive to TRIO participants! We have a selective application process that includes an interview with program staff that assesses both need and ability to benefit. If accepted into TRIO, students sign a provisional contract, which should be previewed here. Ivy Tech Community College's Fort Wayne Campus has many services and resources available to students. Select an item from the dropdown to learn more about each.